Seize the opportunity to discover Umbria - the Green Heart of Italy - with this unique itinerary that will take you to enjoy the best of Italian Culture: medieval works of art, castles, abbeys, superb wines, delicious local food and traditional local festivals. Pamper yourself in the beautiful Central Italy countryside, in the midst of rolling hills, vineyards and olive groves, interrupted by picturesque medieval villages. Visit unique art towns and villages, true "open air museums" in a VIP Luxury Small Group Tour (6 to 14 participants). This VIP Luxury Small Group Tour will allow you to discover in a more intimate way Umbria through its medieval hilltowns, UNESCO World Heritage Sites, mystical Franciscan monasteries, vineyards, olive groves, art festivals and the wealth of the local food & wines. Our VIP Luxury Small Group Tours are restricted to a minimum of six and a maximum of fourteen participants. The use of vans or minibuses instead of larger tour vehicles reduces the impact on local traffic, avoids parking problems, and diminishes any irritation on local daily life. In a large group it would be impossible to stay in a charming family owned boutique hotels, move in cities and villages with ease, deviate from the main roads, browse the shops of local artisans and wander with your local guides who will become your travel companions. 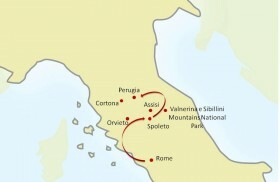 Those represent the best conditions for exploring and discovering “your” Umbria. “Medieval Hilltowns of Central Italy” is an extra-ordinary journey through the marvels of Umbria - the Green Heart of Italy. One itinerary divided into 3 legs that brings first timers and previous travelers to discover Umbria in depth with guided visits led by local experts in the main locations and off the beaten track experiences. 7 Nights accommodation in exclusive and fascinating 4 stars Hotels , with full buffet breakfasts: 1 Night in Rome, 3 Nights in Spoleto, 3 Nights in Perugia. Welcome cocktail at your arrival in Rome. Welcome Dinner in Rome, Dinner at your hotel in Spoleto, Dinner at your hotel in Perugia and Dinner at the Polvese Island (Lake Trasimeno). Lunch in a typical trattoria in Orvieto, Lunch in a typical osteria in Perugia and Pizza Lunch in Assisi. Private sightseeing Tours with expert local English speaking guides in Orvieto – Perugia – Assisi – Cortona, including all skip the line entrance fees to the sites. Visit of Civita di Bagnoregio, the so-called “the dying village”. 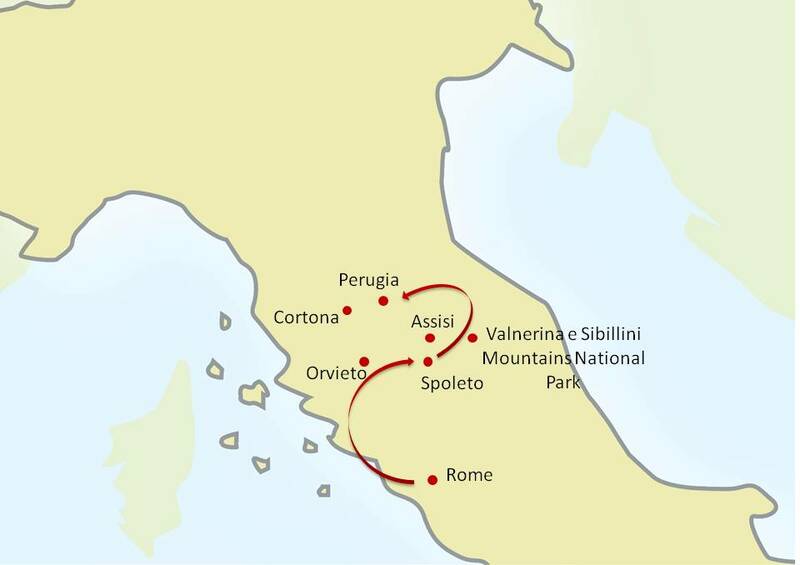 Full Day excursion in Valnerina and Sibillini Mountains National Park. Trekking with mules in Castelluccio and pic-nic Lunch included. Private full Day excursion to Montefalco and Bevagna. Cooking Class at a Wine Estate in Montefalco (hands-on cooking lesson, recipe book, Lunch, winery visit and wines tasting included). Visit of a Medieval Textile artisan workshop in Perugia. Small-group chocolate workshop with tastings in Perugia. Lake Trasimeno Cruise with Aperitivo on board. Private transfers with deluxe van with English speaking driver for transfers and excursions. Tour begins in Rome and ends in Perugia. Welcome Cocktail and group briefing at your arrival in Rome. Welcome Dinner in a typical restaurant in one of the most lively and characteristics neighborhoods in Rome. Explore the ghost village of Civita di Bagnoregio, almost utterly untouched by the Renaissance, a medieval village built on a hill and accessible only by a long stone walkway and so-called “the dying village”. Private guided Tour of Orvieto, the city on a volcanic rock of tufa-stone, with its amazing Cathedral, one of Italy's most astonishing gothic churches. Delicious Lunch in a typical Trattoria. Full Day in Valnerina and Sibillini Mountains National Park. Trekking with mules in Castelluccio through the valleys and mountains, following the paths of sheep seasonal migrations and the water springs; pic-nic Lunch included. The heart of the park is Norcia, birthplace of Europe’s patron saint St. Benedict and famous for its “norcinerie” – cured meat workshops. Stop in Vallo di Nera, a medieval fortress village characterized by stone houses, extraordinarily preserved from 1217. Stop in Spoleto: admire the Abbey of St. Eutizio, famous for the monks’ ability to use medicinal herbs and home of the museum of the first Italian school of surgery. An easy drive amongst vineyards and olive groves will take you to Montefalco, surrounded by medieval walls, it offers a breathtaking 360° view of the Umbrian Valley where the Sagrantino grapes are grown. Cooking Class at a famous Wine Estate: you will prepare a complete menu based on genuine Umbrian ingredients. Pairing wines served with each course. Visit the charming medieval town of Bevagna, with its frescoes of Umbrian school and also famous for its “Mercato delle Gaite”: every June for 10 days the village is literally transformed reproducing life like it was in medieval times. Walk with your guide through the historical centre of Perugia, a cosmopolitan city full of history, art and culture. The visit will include the beautiful Palazzo dei Priori with the Hall of Notaries, the Corso Vannucci, the Fontana Maggiore, the Collegio del Cambio with the extraordinary Perugino’s frescos and a Medieval Textile artisan workshop. Lunch in a typical Osteria and Dinner at your hotel, a beautiful castle in Perugia. 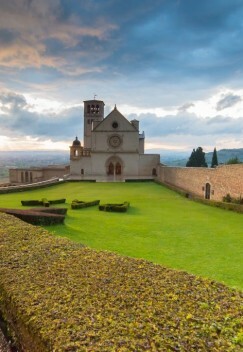 Guided Tour of Assisi, the city of St. Francis, with the beautiful Basilica decorated with the famous Giotto’s frescoes, built upon the Saint’s tomb. Pizza Lunch in a restaurant in the Valley of Assisi. Chocolate making experience, tradition for which Perugia is famous all over the world: hands-on under the supervision of a master chocolatier. Transfer to Cortona, characterized by its medieval palazzo, small streets and amazing views over the Valdichiana and birth place of famous artists as Luca Signorelli and Pietro da Cortona. Lake Trasimeno cruise at sunset with an Aperitivo on board and Dinner at the Polvese Island.